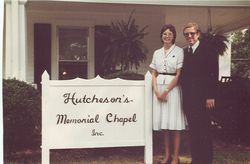 Hutcheson's Memorial Chapel opened the doors to serve Buchanan, Haralson County and the surrounding area on August 7, 1983. This was the realization of a dream of Danny and Patty Hutcheson to serve their home county as Funeral Directors. During the first ten years of business the funeral home also provided 24 hour emergency and non-emergency ambulance service. This was accomplished with the able assistance of Ken McWhorter who worked us with at the funeral home from the beginning along with Dorothy Weatherby. Ken unfortunately died suddenly in 1998 of a heart attack. There were a number of others who helped out during the early years when we would be busy. Danny's father, Jimmy helped out around the funeral home until his death in 1991. Patty's father, Everett Simpson has assisted as needed since the beginning. The late Dorothy Weatherby started out answering the phones and dispatching ambulance calls from day one. Jimmy Sanders is another gentleman that has been a huge asset since the beginning. Jimmy starting working at the funeral home the irst week it opened. Bud McPherson started assisting with services and visitations in 1989 and continues to this day. Darwyn Summerville has been associated for over 20 years with the funeral home and he is a funeral director and embalmer. Since our humble beginnings we have been honored to serve hundreds of families in the West Georgia area. We look forward to a long future ahead serving the funeral service needs of the area.